Riding a New Jersey Transit train with New Jersey Gov. Phil Murphy, heading to New York City Penn Station. New Jersey Gov. Phil Murphy toured the aging North River Tunnel on Monday that carries 200,000 New Jersey Transit and Amtrak passengers each day under the Hudson River between New Jersey and New York Penn Station. 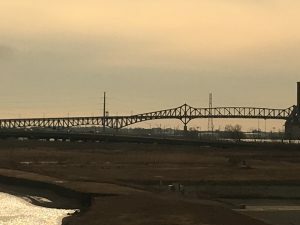 Transportation professionals want to preserve the Northeast Corridor functionality by repairing the existing North River Tunnel and create redundant capacity for Amtrak and New Jersey Transit. Sigmund said there is a Jan. 31, 2019, date for moving the Portal North Bridge project to the next phase of the federal grant funding process.